This book is no longer for sale. We designed the front cover for this one and converted it to epub and mobi. The images had to be optimised and inserted into the book and careful attention was paid to the sub level headings. Starting a new diet? Want to lose weight quickly and safely? 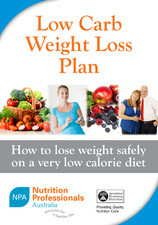 This guide is written by Accredited Practising Dietitians. It will give you the information that you need when using a meal replacement. Practical hints and ideas are provided for a very low energy, low carb diet, as well as guidelines for grading back onto regular foods.